It’s almost time for Skidaway Farms 9th Annual Spring Festival! Tickets are on sale now, so don’t delay. Our Spring Festival Tickets sell out fast! 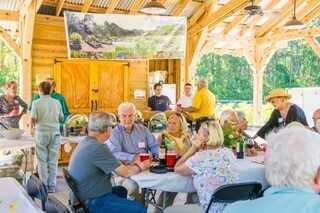 The Festival takes place Wednesday, May 1 from 4:30 to 7:30 p.m. at Skidaway Farms located off McWhorter Road. The cost per person for dinner is $35. BYOB, water available. A portion of your ticket price will be a tax-deductible contribution to support farm educational projects. We thank you for supporting Skidaway Farms in this way. To register or for payment information, visit SkidawayFarms.net. This advance sale tickets only event offers a wonderful evening of “Dining in The Garden” with 130 of your close friends and family, delicious food selections, and for the first time this year a 50/50 raffle. The evening is planned by a very dedicated group of our farmers. The food preparation is headed up by two of our favorite farmers Joe Tyson and Tom Rosen assisted by nine of their Men’s Gourmet Group members. Skidaway Farms is a 503c Not-for-Profit organization started in 2011 by a tenacious group of Landing’s homeowners seeking a location to enjoy their own garden. Through an abundance of sweat and tears, Skidaway Farms was developed and flourishes. We hope to see you at the Farms for a fabulous evening to celebrate our harvest!